Marvel NOW has some of the top heroes in comics! 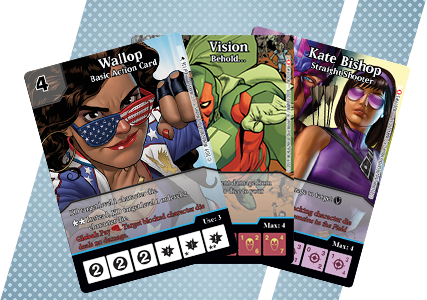 Whether you’re talking about classic heroes with a new spin like Vision or new heroes taking on a classic mantle like Kate Bishop this OP kit has something for you! Jump into the action yourself at your FLGS! In the Marvel Dice Masters: Marvel NOW Heroes Monthly OP Kit players face off in tournament play at their FLGS for the chance to win exclusive prizes. Once your store is registered in the WIN, you can schedule your Marvel Dice Masters: Marvel NOW Heroes Monthly OP event using the official template in the “create an event” section of the site! The Marvel Dice Masters: Marvel NOW Heroes Monthly OP expands on the Dice Masters Organized Play event series based on the Marvel Universe.